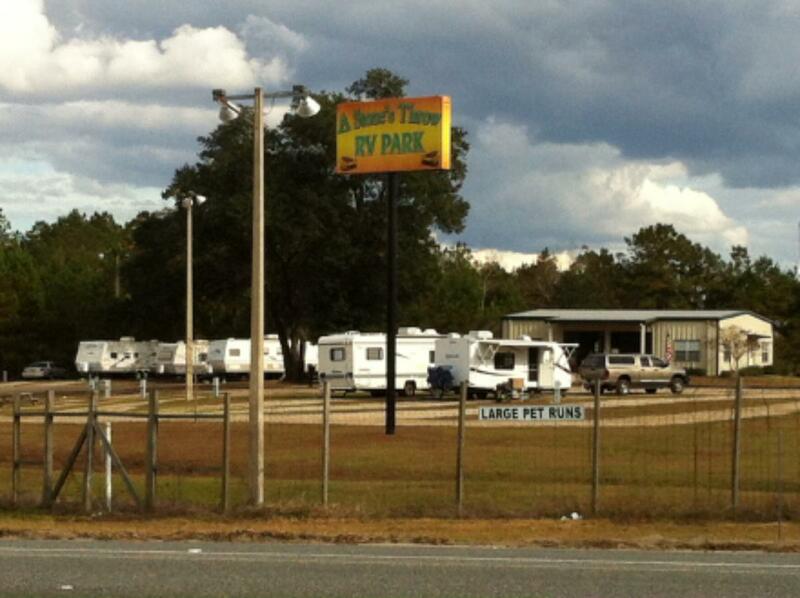 A Stone’s Throw RV park is a 20 site camp ground located at the intersection of I-10 and U.S. Highway 19. We are set up to handle large motor homes with tow cars or your standard pull behinds. Each site has full hook-up including water, 30 & 50 amp power, sewer and strong, fast WiFi signal. We, the owners are avid RVers. When traveling we really appreciate finding an RV park Monticello, FL that is close to the Interstate or other major highways that we may be on, that is why we chose this location. When staying at our RV Park there is no wondering what it may look like or if there is room for your Big Rig. It can be seen while you are coming down the east bound off ramp of I-10. We are literally “a stone’s throw” from 2 major highways. Thank you for choosing A Stone’s Throw RV Park Monticello Area.